I study campaigns and elections, and in particular campaign advertising and election financing. I devoted a fair amount of work in my dissertation to studying the Federal Election Commission’s (FEC) reading of Advisory Opinions (AOs) on permissible electioneering and fund-raising. In recent months, I’ve worked to collect all recorded votes at the FEC on those AOs, as well as on their enforcement cases (called Matters Under Review, or MURs). I’ve used these voting data in the past, but am trying to get the complete archive of posted votes collected as part of a longer term project on ideological polarization at the FEC. 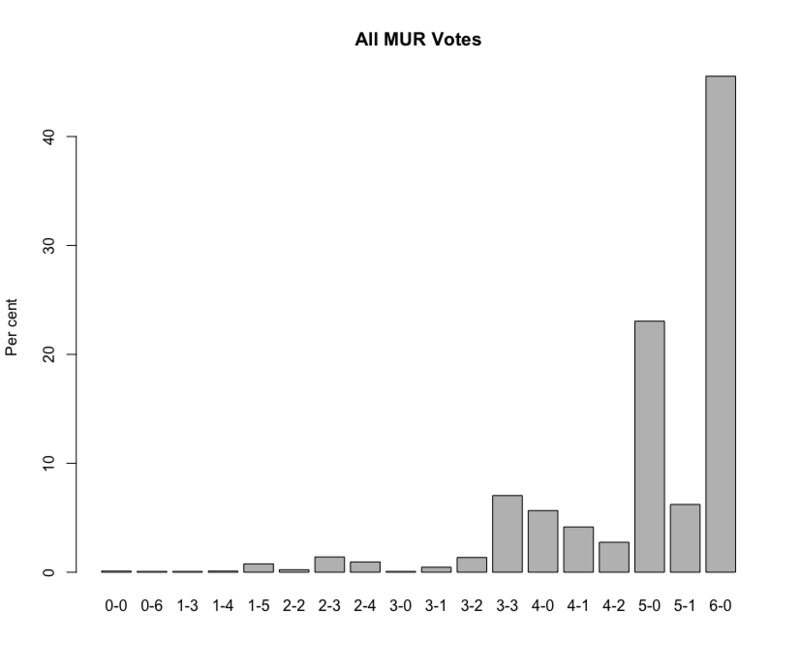 On the MUR data, where the FEC votes to proceed or to cancel an investigation into proposed wrong-doing in areas of campaign finance, the distribution of votes–which date back to around 1998 (with earlier votes somewhat harder to track)–looks like the below graph. There are 6 commissioners and the modal vote is unanimity. This is not news to those that study this, but the data are a real trove in looking for partisan patterns over time and for voting relationships between pairs of Commissioners. More to come as I dig in.